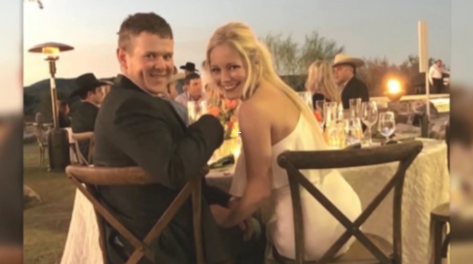 UVALDE, Texas — A newlywed couple died when the helicopter they were flying hours after their wedding crashed in the rugged terrain of southwest Texas. The 76-year-old pilot, Gerald Douglas Lawrence, was also killed. Federal transportation authorities said he was "very experienced" and it's too early to determine a cause of the accident. William Troy Byler and Bailee Raye Ackerman Byler, both 24, were killed in the crash shortly after midnight Sunday about 10 miles northwest of Uvalde, said Steven Kennedy, justice of the peace for Uvalde County Precinct 1. Craig Hatch, an air safety investigator with the National Transportation Safety Board (NTSB), said they will attempt to conduct a thorough initial examination of the wreck. However, the helicopter is located in a "precarious" spot on a side of a hill, a few miles from State Road 55, CBS affiliate KENS-TV reports. "Because of how it's laid out on the side of the hill, we're not really able to go into the helicopter," Hatch said, adding that debris was scattered over about 100 yards. KENS-TV points out NTSB investigators usually document and examine a crash site as much as they can before altering anything, similar to a crime scene. However, Hatch said it's almost impossible to do in a way where NTSB members don't "come tumbling down the side of the hill as well." "We definitely saw a helicopter in a terrible state," said Rachel Kellner, a Texas Game Warden. Kellner was one of the first responders on the scene and said there was little they could do without any daylight. The newlyweds were seniors at Sam Houston State University in Huntsville, according to The Houstonian, the university's student newspaper. They married Saturday night at a large Byler family ranch near Uvalde and left aboard a Byler family helicopter after the reception, Kennedy said. Hatch said Lawrence was "very experienced (and) highly qualified," adding he believed he had logged about 24,000 hours. The cause of the crash hasn't been determined, but Hatch said a preliminary NTSB report will be issued in about two weeks. KENS-TV said it's also too early to tell if weather played any substantial role in the crash.